This page contains a sampling of Agency MAPS, DATA, STATISTICS, and ANALYSES. 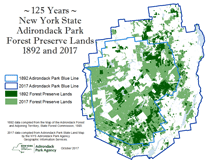 Here's a brief history of GIS at the Adirondack Park Agency. 2018 Facsimile of the official zoning map showing private and state land classifications. Also includes the Adirondack portion of the NYS Wild, Scenic and Recreational Rivers System. View 2017 state and private land class acrage statistics by county and by town or village. New and existing structures for which the APA has permitted cellular service use (1993 - 2018). See Adirondack Park Towers Information for a complete list of permitted structures and other important information. 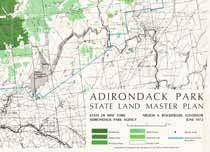 June 1972 edition of the Adirondack Park State Land Master Plan map produced by the State of New York Adirondack Park Agency, Nelson A. Rockefeller, Governor. Indicates Wilderness, Canoe Area, Primitive Area, Wild Forest, Intensive Use state land classifications at that time. "the Adirondack Park - A Map of State Forest Lands, Mountains, and Waters"
Adirondack Park Visitor Interpretive Center (VIC) tourism map from 2003. Includes an Adirondack Gazetteer showing locations of state land units, populated places, major lakes, major mountains, and state campgrounds. The Adirondack Park Agency no longer operates the Paul Smiths VIC or the Newcomb VIC. Census Population of Towns Within the Adirondack Park With Estimates for Census Blocks Straddling the Park Boundary. Additional estimates of seasonal population and several 2010 Adirondack region KMZ data layers are also available. The question was raised,"how many people live within a days drive of the Adirondack Park?" 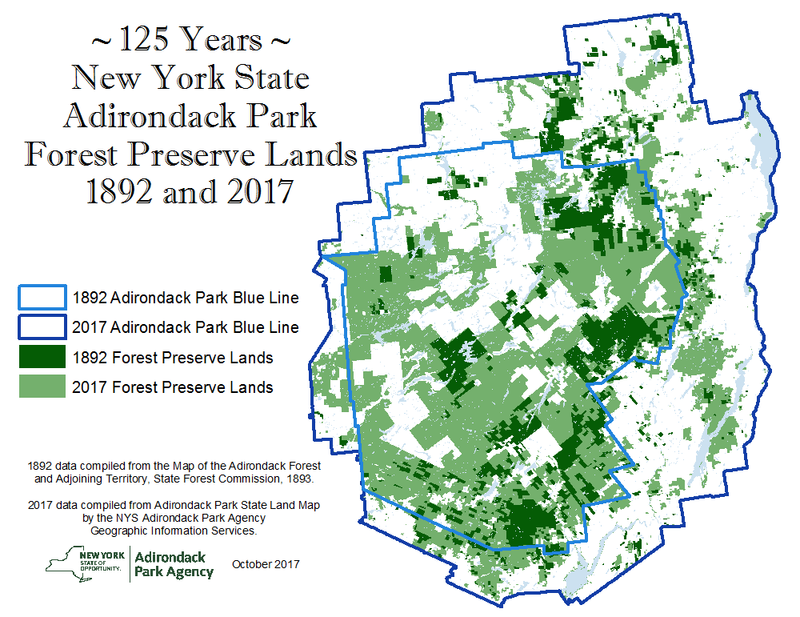 This map and the GIS analysis behind it uses census data from the US and Canada clipped with a 350 mile buffer around the Adirondack Park. Our guess of a days car drive was derived from a 7 hour travel day with an average speed of 50 miles per hour. So how many people are only a day away? There are around 84 Million people including about 18,000,000 Canadians and 66,000,000 Americans. State owned Conservation Easements in the Adirondack Park from 2015 county parcel data. Parcels were identified using NYS DEC easement data. An interpretation by the USGS of general forest covertypes in the United States. A map of New York's Air National Guard Adirondack Military Training Routes, or MTRs. A map of lakes and ponds wholly surrounded by Forest Preserve. A map of trails and roads aljacent to the Remsen-Lake Placid Travel Cooridor. 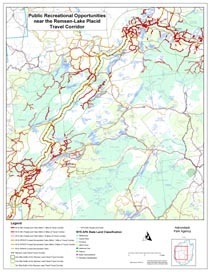 A map of existing recreation opportunities and Natural Resources Limitations along northern portion of the Remsen-Lake Placid Travel Cooridor. The following two layers of wetland data are provided to assist the public in planning projects in the Adirondack Park. The data may not show all wetlands that are present in an area or the precise boundaries of wetlands. For a determination on whether a wetlands permit is required, project planners are encouraged to contact Agency staff. It may even be necessary for Agency staff to visit the property in order to assess whether wetlands will be affected by a planned project and to determine if a permit is needed. For more information, consult our Freshwater Wetlands flyer. 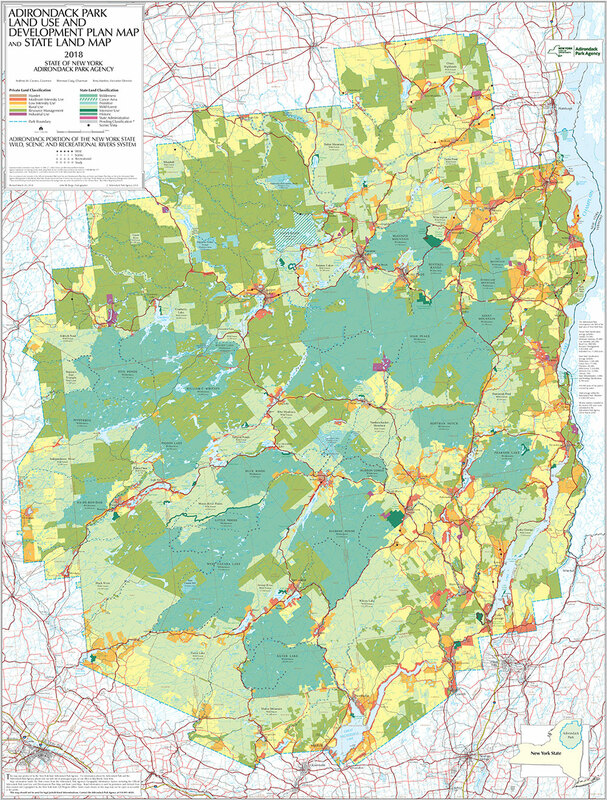 Adirondack Park Agency processing of 2010 US Census data for portion of northern New York State. In the basement of the APA headquarters there's a room called the "Cart Room." Cart is short for Cartography. Over the years this room has been filled with drafting tables, boxes stuffed with oversized rolled maps and flat files holding nearly 200 drawers of "quad" maps. Drafting pens and mylar began to give way in 1981 to our first computer affectionately but cautiously called "HAL." This was before the days of DOS when "digitizing" was an unknown concept to most of us. Hal was replaced by a mini-computer then by UNIX, then by Windows. When these computers were still in the minority, they were named Colvin, Marcy and Hudson. Printers and plotters were named Winslow, Homer, and Tait after Adirondack painters. Now PC's are on every desktop - too many to name. The Adirondacks were once "lands unknown." Explorer/cartographers like Verplanck Colvin and Seneca Ray Stoddard began charting the wilderness, providing a reference for us to follow. 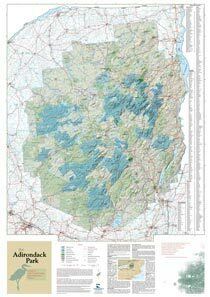 In the 1980's and '90's, digital maps of the Adirondacks by the APA brought these lands to the forefront of modern mapping in the state and perhaps the country. A look at the APA "Lookup System". Describes how GIS is used at the APA headquarters to locate projects in relation to the resources of the Park. The Lookup System is not an on-line GIS application. The Adirondack Park Agency has several interactive maps available here. Streaming geographic data (APA REST Endpoints) for use in your map applications is available here. 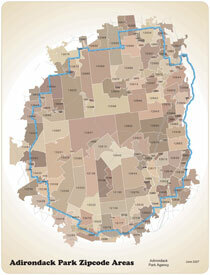 These maps and data should not be used for jurisdictional determinations. Please contact the Agency for classification of your property. APA layer packages with symbology and metadata for park boundary, land class and wetlands. Must have ArcGIS 9.3.1 or above. Orthophotos are photos taken from the air adjusted to overlay with maps. Provides detailed soils maps and descriptions. You must define an Area of Interest first then click the Soil Map tab. NYS OPRHP Historic Preservation Office Access historic and cultural resource databases including National Register documents, building and archaeological inventory forms, and survey reports. After entering CRIS as a guest, click SEARCH to navigate the online map. Historic USGS Maps of New York and New England UNH Library reference images (not geo-referenced) of USGS quads from early 1900's. The Shared Adirondack GIS CD-ROM for the Adirondack Park containing over 50 data layers, published in 2001 is no longer available. View historic bird's eye maps collected from the Library of Congress for several communities in the Adirondack Park. View a YouTube tutorial showing how to enjoy these historic panoramas in Google Earth.